Often blooming around the summer solstice, St. John’s Wort (Hypericum perforatum) has a poetic and complex relationship with the sun. Its bright yellow blooms will stain your fingers red when crushed, which is one reason why its common name pays homage to the Christian martyr, St. John. 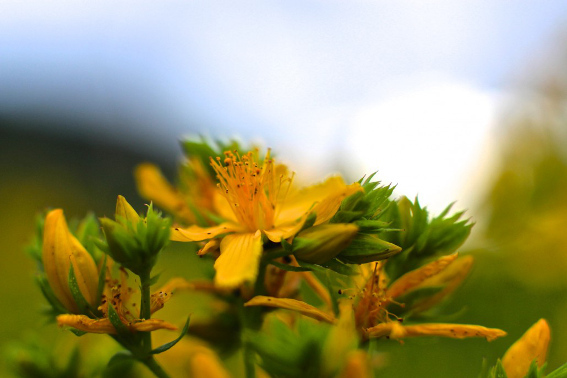 In modern times, St. John’s Wort is often pigeon-holed as the “depression” herb. While there are an impressive number of clinical trials focusing on using the herb for depression, for many herbalists (myself included), St. John’s Wort is only a minor herb for depression. A more thorough review shows that this potent plant shines in many areas, including offering powerful pain relief, healing wounds, and supporting liver health. I’ve chosen to list St. John’s Wort as neutral in regards to its thermal energies. Some herbalists state that it is cooling, while others insist it is warming. I initially sense more warming qualities after tasting it, but its detoxification effects on the liver as well as its ability to relieve “hot” pain lead me to think it has more cooling properties overall. After many years of taking St. John’s Wort, as well as recommending it to many others, I have never seen an adverse effect due to its thermal energies when it is carefully matched to a person. The most pronounced immediate action of St. John’s Wort is its astringent action. While certainly not as strong as oak bark, it is present and constant. It is also noticeably diuretic, making it a decidedly drying plant. Trophorestorative is a term given to herbs that provide nutrients, substances and actions that restore or correct the weakness of a depleted organ or system. Herbs within this category generally have a system affinity for their restorative action. For example, hawthorn restores heart function while nettle seed restores kidney function. 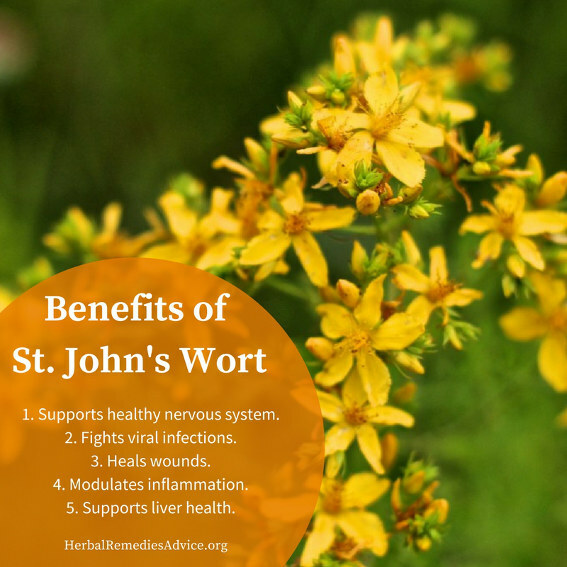 St. John’s Wort has a strong affinity for the nervous system and can be used to restore healthy function in several ways. Nerve pain can be some of the most excruciating and debilitating pain. It’s sharp and burning, often shooting from one end of the body to another. St. John’s Wort can be a powerful remedy for nerve pain. I’ve seen it relieve the sharp pains of sciatica and thoracic outlet syndrome. Many eclectic herbalists recommended St. John’s Wort specifically for spinal injuries and excruciating pain. 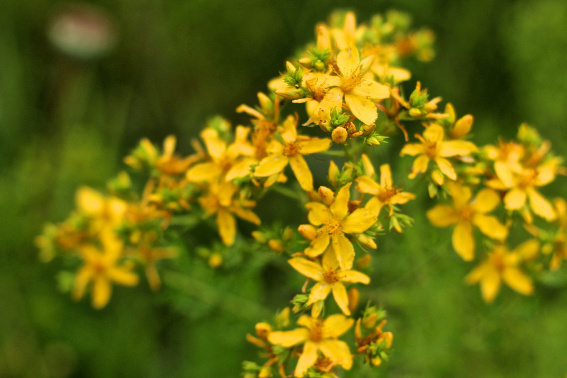 In modern times, St. John’s Wort has become the poster herb for depression. Numerous clinical trials using St. John’s Wort or the constituent hypericin have been done with varying results. 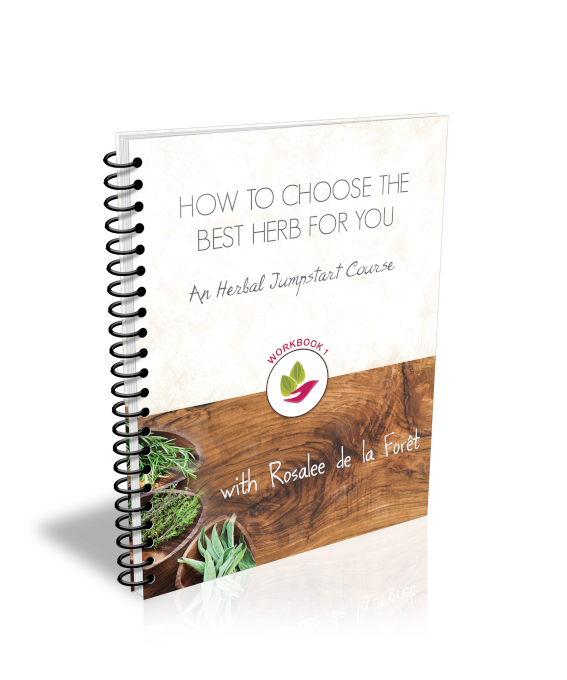 However, while modern science is racing to market the “one” herb (or constituent) for depression, herbalists are keen to recognize that herbs are best chosen for the particular person and not the disease. Some herbalists recommend St. John’s Wort specifically for people experiencing depression due to Seasonal Affective Disorder. This is one area where its poetic and complex relationship with the sun really shines. Herbalist David Winston recommends St. John’s Wort for GI-based or hepatic depression, when a person may have a sour stomach and a sour attitude.4 My friend and colleague, Christophe Bernard, specifically uses it for the elderly who have lost their taste for life and have a dark view of life. It should be noted that St. John’s Wort certainly doesn’t work for “all” types of depression and it takes several weeks of daily use before any results will be seen. Another interesting affinity for the nervous system is St. John’s Wort’s ability to prevent or address Herpes outbreaks. Taken preventatively, it can decrease the number of outbreaks a person experiences; taken at the first sign of an outbreak, it can help to shorten the duration. Part of this action certainly may be due to its effects against the Herpes virus itself. However, I am including it in the nervous system section because the herpes virus lives in nerve cells and St. John’s Wort is often chosen for this particular nervous system virus. St. John’s Wort is also commonly used for a related virus, shingles. This virus is an acute, painful inflammation of the nerve ganglia, that manifests as a skin eruption that often circles around the middle of the body. Herbalists use St. John’s Wort both topically and internally to reduce the duration and relieve the pain of the outbreak. Numerous in vitro and animal studies have shown that St. John’s Wort is likely active against numerous other viruses, but more human clinical trials need to be done to fully understand its therapeutic effects. 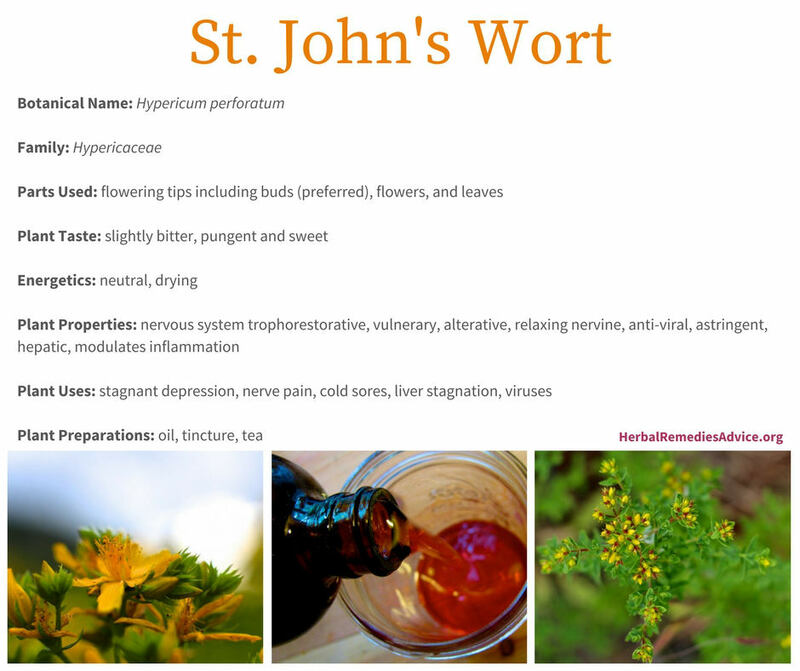 St. John’s Wort has long been used as a hepatic herb (an herb for the liver). Proof of this in modern times has arisen in a notorious way. 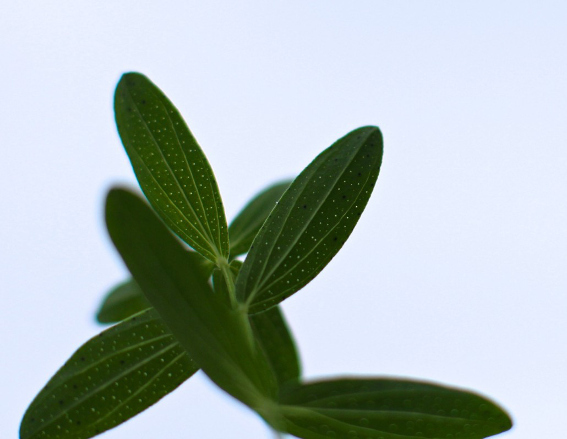 St. John’s Wort speeds up the CYP450 enzyme metabolism pathways in the liver. In fact, St. John’s Wort increases the effectiveness of liver metabolism so effectively that some pharmaceuticals are cleared from the liver before they have had a chance to work. While this has been used to vilify the use of herbs and drugs at the same time, it also shows how powerful this herb is for the liver. A sluggish liver can mean that normal wastes, hormones, and lipids aren’t being properly metabolized. This can lead to hormonal imbalances (such as estrogen or cortisol excess) and impaired digestion. As a result, it is used for a variety of complaints related to estrogen excess, from PMS to PCOS. Herbalists use St. John’s Wort to increase liver metabolism and thus support its natural and healthy function. 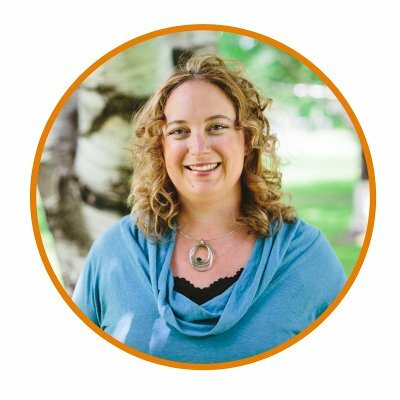 This effect suggests that herbalists would be wise to check St. John’s Wort’s potential interactions when clients are using pharmaceuticals that require a narrow therapeutic range, such as hormones and blood thinning agents (further discussion below). In a randomized, double-blind, placebo-controlled, human clinical trial, women volunteers who had been diagnosed with mild PMS were split into two groups. One group was given St. John’s Wort while the other was given an identical-looking placebo. The results showed that daily use of the St. John’s Wort was more effective than placebo for the most common physical and behavioral symptoms associated with PMS.6 This may be due to St. John’s Wort’s ability to restore liver function, its known effect on the nervous system, its ability to mildly reduce cramping or, more likely, a combination of all three actions plus several others we aren’t even aware of. This synergy of actions illustrates the beauty of our complex herbs. Not often discussed in modern literature, St. John’s Wort has a pronounced effect on urination. I find it to be especially strong when taken as a tea or when taking large amounts of the tincture. The Eclectic literature often specifically recommends St. John’s Wort for someone experiencing “urinary suppression.” In addition to promoting diuresis, several texts, including Maude Grieve and Peter Holmes, mention its use specifically for children experiencing bed wetting. There is a degree of controversy surrounding St. John’s Wort and its ability to either protect people from the sun or to increase the negative effects of the sun. As is often the case, the reason for the controversy stems from complexity. Many herbalists use an infused oil of St. John’s Wort to protect their skin from the sun, as a mild sunscreen of sorts. This protective action can probably be attributed to St. John’s Wort’s excellent anti-inflammatory and vulnerary effects. However, there have been several case studies showing that using St. John’s Wort increased photosensitivity, leading to blisters and severe burns. Regular internal use of St. John’s Wort in whole-plant form (tea or tincture) does not appear to cause photosensitivity. Internally using large amounts of hypericin, an isolated constituent of St. John’s Wort, increases the likelihood of experiencing photosensitivity. Be aware that there are reports from herbalists of people using St. John’s Wort in normal amounts who have experienced photosensitivity. I think it’s prudent to keep this in mind and to slowly test out someone’s personal level of sensitivity. However, there is ample evidence that St. John’s Wort does protect the skin from sun-induced skin damage, both anecdotally and scientifically. A friend of mine who grew up in the southwest desert was diagnosed with having pre-cancerous skin cells on her nose. The doctor told her they should be surgically removed and that she would have to avoid being in the sun for at least two months following the procedure. Since it was the beginning of the summer and she lived in the winter-dreary Pacific Northwest, she opted to wait until the fall to have the surgery. In the meantime, she used St. John’s Wort oil over the area every single day. When she returned to the doctor in the fall he was surprised to see that the area had noticeably improved. Another friend of mine, who is a farmer, had pre-cancerous cells on his nose. He also chose to use St. John’s Wort oil to address it. After applying it continuously for a year, his nose had no more visible signs of the pre-cancerous cells. Both of these people continue to use St. John’s Wort daily as a preventive therapy. While I certainly would never advise someone to ignore doctor’s advice regarding skin cancer treatment, I share these stories to illustrate the potential healing power of St. John’s Wort. While many herbalists favor the use of the whole St. John’s Wort plant, many modern clinical trials have focused on using isolated extracts, notably hypericin and hyperforin. I am not adamantly opposed to using isolated chemical extracts, but at this point I have no doubt that the most benefits come from the complexity of the whole herb. If St. John’s Wort is famous for depression, it is probably equally infamous for its known effects on pharmaceutical drugs. As discussed above, it increases the metabolic pathways used by many drugs, thus reducing blood levels of the drugs and potentially rendering them ineffective. For a more thorough review of the actions between pharmaceutical drugs and St. John’s Wort, I recommend the Botanical Safety Handbook by AHPA or Herb, Nutrient, and Drug Interactions: Clinical Implications and Therapeutic Strategies by Stargrove, et al. With St. John’s Wort, it is really important to know when to choose the fresh plant and when to choose the dried plant for your preparations. The fresh plant material is strongly preferred for making an infused oil. In fact, I wouldn’t waste your time using dried St. John’s Wort in oil. Prepare the oil by infusing the fresh flower buds into oil that is placed into the sun. Visit the oil every day for several weeks to make sure all plant parts are below the surface. Some herbalists think that placing an oil in the sun increases its degradation but, while that rationally makes sense, I have always done St. John’s Wort oil like this and have never experienced problems. In researching this article, I read that King’s American Dispensatory even recommends the solar infusion method! Although the oil is often infused in the sun, once the herb has been strained off, it is best to keep it in a dark cool location. When preparing St. John’s Wort as a mild sunscreen, many herbalists prefer a sunflower oil infusion. When making St. John’s Wort salve or lip balm, I use olive oil. One year I infused St. John’s Wort flower buds in jojoba oil to make a protective skin serum that was very lovely. Fresh St. John’s Wort is also preferred for the tincture. I have heard of people using dried plant material for the alcohol extraction, but I suspect it is significantly weaker than tinctures made with fresh St. John’s Wort. 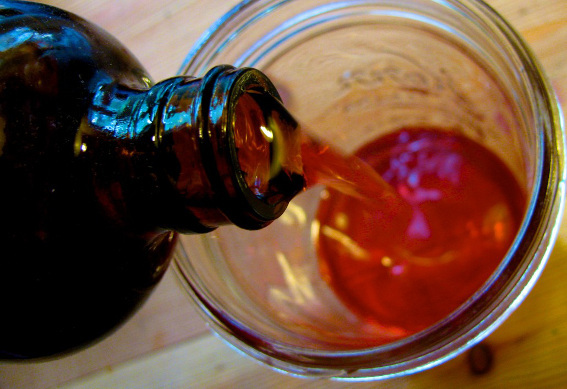 Whether you are making St. John’s Wort oil or tincture, you’ll know the strength of your final project by how deeply red it is. Pale pink preparations are not ideal. It is frequently stated that St. John’s Wort doesn’t work when dried, but dried material works very well when used as a tea. I’ve done this for years and have recommended it to many clients with success. One year I had an abundance of St. John’s Wort (ordered from Ancestree Herbals) and was inspired to make a mead. The resulting delicious brew was incredibly euphoric and then notably sedative. As noted above, St. John’s Wort is contraindicated with many pharmaceutical drugs. Do extensive research before using it with people who are taking medications. Some people find that taking St. John’s Wort (especially standardized extracts) causes photosensitivity. Do not use artificial light, such as a tanning bed, while taking St. John’s Wort internally or applying it externally. Do not concurrently use St. John’s Wort with other photosensitizing drugs. Most herbalists use Hypericum perforatum, but I am told that any St. John’s Wort that stains your fingers red when crushed will work. There are many ornamental St. John’s Worts that will not work, so be sure to give the finger crush test. For a full listing of Hypericum species found in North America visit the USDA page for Hypericum. Hypericum perforatum is native to Europe and parts of Asia but has now spread throughout the world. It’s an herbaceous perennial plant that likes to grow in sunny fields, but also enjoys getting a fair amount of moisture from the earth. I often find it growing in the gravelly sand beds of rivers or wet meadows. It can grow anywhere from one to three feet in height. The yellow flowers are radially symmetrical with five petals. They have an obvious superior ovary with many stamens. The “perforated” leaves are what gives this plant its species name. If you hold a leaf up to the light, you’ll see tiny black “holes” or oil glands in the leaf, giving it a perforated appearance. St. John’s Wort is a beautiful and prolific weed in North America that can be effectively used for a variety of acute and chronic conditions, from healing wounds and nerve pain to supporting nervous system and liver health and fending off viral attacks. 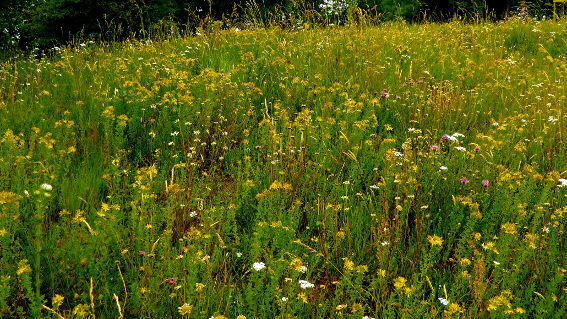 Harvesting the bright yellow flowers on a sunny day, infusing the oil in sunlight, and using the resulting dark red oil for skin protection and health is a favorite summer solstice ritual for many herbalists. Kress, Henriette. Practical Herbs. Helsinki, Finland: Henriette Kress, 2013. Moerman, Daniel E. Native American Ethnobotany. Felter, Harvey Wickes, and John Uri Lloyd. King's American Dispensatory. Eighteenth Edition. Third Revision ed. Winston, David. Differential Treatment of Depression and Anxiety with Botanical and Nutritional Medicines, 2006 and 2014. Clewell, Amy, Matt Barnes, John R Endres, Mansoor Ahmed, and Daljit K S Ghambeer. "Efficacy and Tolerability Assessment of a Topical Formulation Containing Copper Sulfate and Hypericum Perforatum on Patients with Herpes Skin Lesions: A Comparative, Randomized Controlled Trial." Journal of Drugs in Dermatology : JDD 11, no. 2 (2012): 209-15. Canning, Sarah, Mitch Waterman, Nic Orsi, Julie Ayres, Nigel Simpson, and Louise Dye. 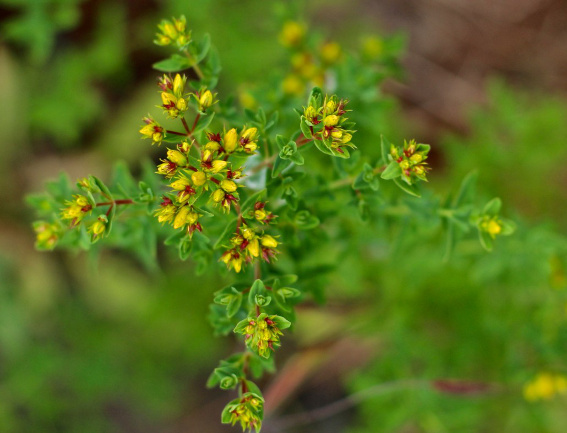 "The Efficacy of Hypericum Perforatum (St John's Wort) for the Treatment of Premenstrual Syndrome: A Randomized, Double-blind, Placebo-controlled Trial." CNS drugs 24, no. 3 (2010): doi:10.2165/11530120. Samadi, Sareh, Talat Khadivzadeh, Ahmad Emami, Naser Sanjar Moosavi, Mohsen Tafaghodi, and Hamid Reza Behnam. "The Effect of Hypericum Perforatum on the Wound Healing and Scar of Cesarean." Journal of Alternative and Complementary Medicine (New York, N.Y.) 16, no. 1 (2010): doi:10.1089/acm.2009.0317. Meinke, Martina C, Sabine Schanzer, Stefan F Haag, Federica Casetti, Marcel L Müller, Ute Wölfle, Anke Kleemann, Juergen Lademann, and Christoph M Schempp. "In Vivo Photoprotective and Anti-inflammatory Effect of Hyperforin Is Associated with High Antioxidant Activity in Vitro and Ex Vivo." European Journal of Pharmaceutics and Biopharmaceutics: official journal of Arbeitsgemeinschaft für Pharmazeutische Verfahrenstechnik e.V 81, no. 2 (2012): doi:10.1016/j.ejpb.2012.03.002. Gardner, Z. E., and Michael McGuffin. American Herbal Products Association's Botanical Safety Handbook. Boca Raton: American Herbal Products Association, CRC Press, 2013. Nieminen, Tuija H, Nora M Hagelberg, Teijo I Saari, Mikko Neuvonen, Kari Laine, Pertti J Neuvonen, and Klaus T Olkkola. "St John's Wort Greatly Reduces the Concentrations of Oral Oxycodone." European Journal of Pain (London, England) 14, no. 8 (2010): doi:10.1016/j.ejpain.2009.12.007. Fogle, Robin H, Patricia A Murphy, Carolyn L Westhoff, and Frank Z Stanczyk. "Does St. John's Wort Interfere with the Antiandrogenic Effect of Oral Contraceptive Pills?" Contraception 74, no. 3 (2006): doi:10.1016/j.contraception.2006.03.015. Kuhn, Merrily A., and David Winston. Winston & Kuhn's Herbal Therapy & Supplements: A Scientific & Traditional Approach. Philadelphia: Wolters Kluwer/Lippincott Williams & Wilkins, 2008. Stojanović, G, A Ðorđević, and A Šmelcerović. "Do Other Hypericum Species Have Medical Potential As St. John's Wort (Hypericum Perforatum)?" Current Medicinal Chemistry 20, no. 18 (2013): 2273-95.